DIY - House Number fundraiser! 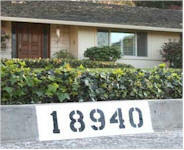 For this fundraising idea, paint street numbers on curbs in front of houses. Using a cardboard cutout, paint a dark rectangular background on the curb. After it dries, paint the house number in reflective paint. neighborhood with good curbs and canvas the neighborhood one or more weeks ahead, taking orders and collecting payment. Advertise your services by going door-to-door and talking to homeowners. Leave printed flyers on doors of homeowners who are not home. Specify an initial and rain date when the work will be done. You may wish to give a ten day period (two weekends) to allow for possible delays. You will need several sets of stencils, masking tape, and black background and reflective spray paint. Work in teams of three. One to sweep the curb, one to paint the background and one to paint the house number. Since you will need to let the background paint dry before applying the house number, you may be able to get by with teams of two, depending on the size of the neighborhood. Have additional order takers available on “paint” day for the homes you missed previously. Your worker’s activity will create additional sales.